This page tells the story of the world's first jazz orchestra. 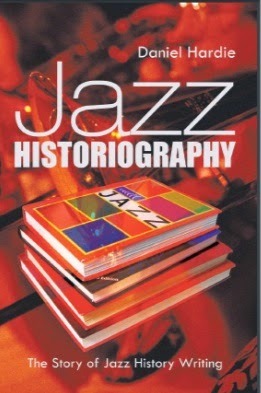 whether it was printed wrong way round in the first edition of Jazzmen. be Warner and Lewis the seated man. appears to be wearing white tie. photographs show two clarinets being employed. lead was played by the violin and Bolden “ragged” behind the lead. and was replaced by Duson. supplied to the authors of Jazzmen following an interview between C.E. Smith and Willie Cornish in 1938. Band, Warner or Lewis was pressed into service as leader. clarinet show its length overall to be .83 times that of a Bb instrument. fitted with a mouthpiece cap while that of the seated player does not. seated player's instrument as a C clarinet. or a Bb with a long mouthpiece cap. 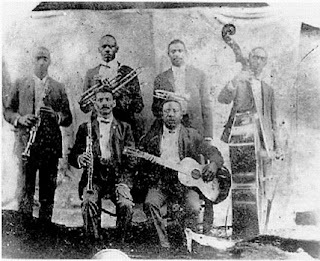 Bolden band photo as a C clarinet. Lorenzo Staultz took over the guitar chair. Warner), cornetist (Ed. Clem) and valve trombone (Tom Landry). band to accept professional engagements on his own behalf. photo. Wallace Collins apparently played tuba on such occasions. Eagle Band to carry on the tradition. blues formerly played by street bands to dance hall audiences. Bolden Orchestra fall into that category. a favourite with his audiences. Wait till the Sun Shines Nellie (1905). composers of the Joplin School were apparently performed. Chapter 13 p166 ff and p 173.
styles. These were orchestras trained in the conservatory tradition. incompetent, even hokey, but there is no evidence to support this. rhythmic elements were also noted. light sounding rhythm section similar to that of the Bolden Band. violin/leadership role in the early jazz bands. Creole Orchestra but sadly that group was never recorded. performances in even earlier historical works. music suited to the newer dances of the ragtime era. which was 1939 not 1935 as shown in the published version. 2. Who Was the Leader? Band. He also correctly identified the players. often from a written score - zur Heide called him the musical head. New Orleans Style Chapters 4 and 5.
star cornet players, Manuel Perez and Freddie Keppard respectively.